The procedure involves removing the patient’s hip joint and associated cartilage then replacing it with an artificial joint. The joint is comprised of two pieces: a ball and socket. These pieces are what move together and allow the hip to still remain mobile after surgery. Most patients will receive a ceramic or metal hip replacement, depending on the type of surgery they need, age, and their insurance. While this type of surgery was originally created to relieve patients from long-term pain and return their mobility, there are patients that have experienced dangerous complications. The complications come from defects in the product itself. While some patients experience some pain and discomfort, it can cross a line. Some complications related to corrective surgery that deal with defective equipment in particular, is unnecessary. What is Hip Replacement Surgery and Why Is It Performed? Hip replacement surgery is a surgical procedure,which involves removing the hip joint and replacingit with an artificial one. This procedure is performed when other pain relief and therapeutic treatments do not relieve a patient from daily pain and discomfort. The procedure will not only relieve pain, but return a patient’s mobility. Believe it or not, hip replacement surgery can actually be minimally invasive for some patients, while other patients require a more complicated and involved hip replacement procedure. During the standard procedure, patients must go through general anesthesia, which can be a serious risk especially for older adults with health issues. Patients will remain in the hospital after surgery for several days up to a week, depending on the type of hip replacement surgery performed. Physical therapy will often begin just one day post-surgery and the patient will experience minor discomfort and pain, which is normal. Several weeks after recovery, when a patient begins to use the hip joint more frequently is often when he or she begins to notice the signs of a potential defect. Most hip replacement components are made from all metal components.These metallic implants were designed and marketed to be more effective and durable than other implants. Ironically, however, these metallic parts are also those that cause the most pain and injury. Patients who have experienced these complications have suffered through long-term hospitalizations to treat infections and pain. The manufacturers of these hip joints are now facing class action lawsuits. Why Does This Involve a Lawsuit? A person will choose to undergo hip replacement surgery and they know that the procedure itself is dangerous and recovery can take time. But, they accept that risk because they know in the end they will have less pain and improved mobility. Patients are willing to take on the surgical risks, time in therapy, and hope that they will recover fully. However, metal hip replacements reduce the chances for a successful recovery and many patients end up having a worse quality of life than they did before surgery. Do You Have a Metal on Metal Hip Replacement? Health is important to millions of Americans and the companies that manufacture these hip replacement products are supposed to do so with the utmost care. When they fail to test their products or they fail to protect the public, then they must be held accountable. 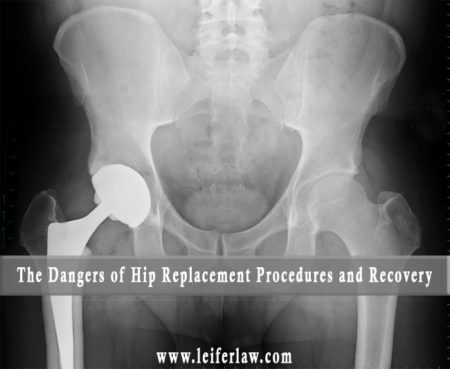 If you have had a hip replacement surgery performed with metal hip replacements, then you may want to contact an attorney for your defect claim. The defective medical device attorneys at Leifer Law Firm can help you with your defective medical device claim. We represent clients in the class action lawsuits against manufacturers of faulty hip replacements and we can assist you with your case as well. To get started, contact us for a free consultation by calling 561-395-8055 or visit us at one of our locations in Boca Raton, Fort Lauderdale or West Palm Beach, Florida. You can also fill out an online contact form and an attorney will be in touch with you shortly.